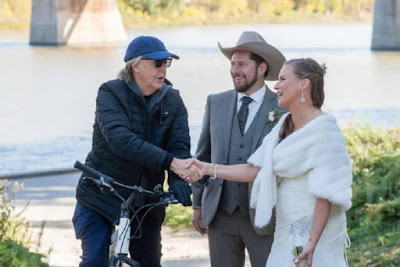 Soon-to-be newlyweds Jen Roscoe, 39, and Steve Gregg, 38, were having their wedding photos taken along Winnipeg's Waterfront Drive on Saturday afternoon when Paul McCartney — still in the city after a Friday night concert — rolled up on a bicycle. "He went by on the bike … and he said congratulations as he rode by and Steve said 'that was Paul McCartney,'" laughed Jen about the experience. 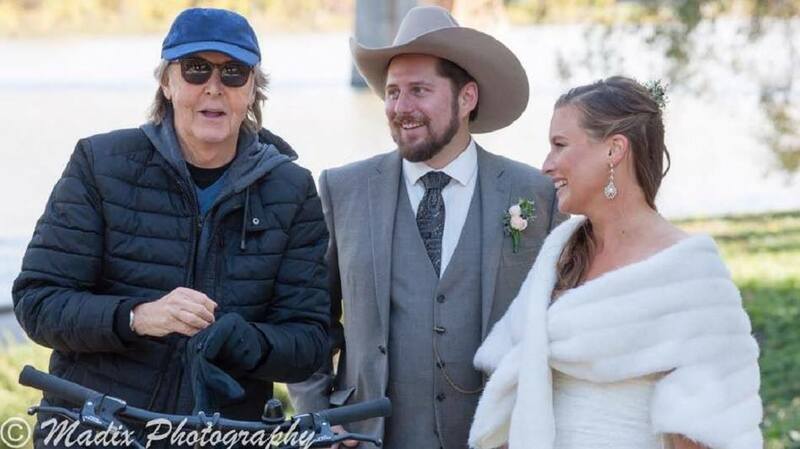 But McCartney and the two security guards riding with him were on a path that hit a dead end. So they were forced to turn around and come back to the couple, which wasn't going to let a golden opportunity pass by again. 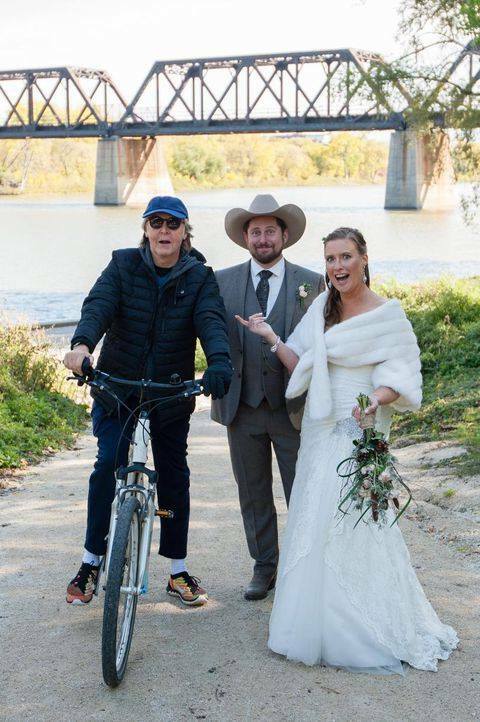 "As he was coming back up we said 'hey man wanna photo bomb our wedding?' And he was gracious enough to stop," said Roscoe. In all, Gregg says the encounter lasted about 20 seconds. "We said 'are you enjoying Winnipeg?' he said 'I am' and that was about it." The meeting was quick but the moment will last for much longer thanks to Roscoe and Gregg having a professional photographer with them to preserve it. MADIX Photography, who took the pictures, posted the photos to their Facebook page Sunday. 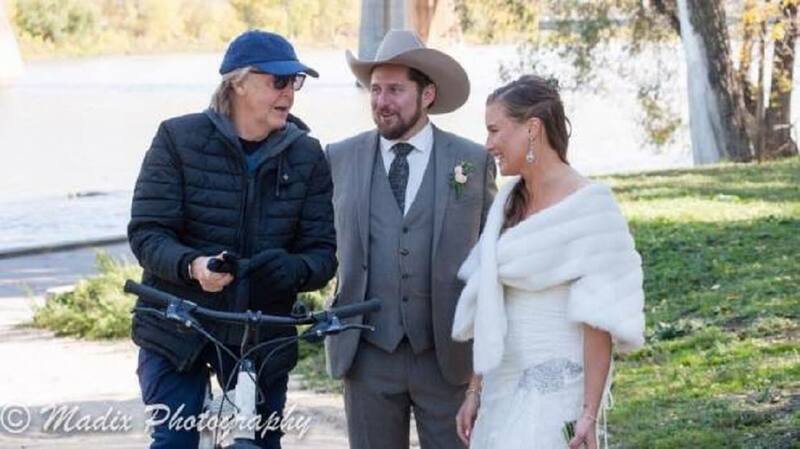 The couple, who were married at a ceremony at Fort Gibraltar later in the evening, say they've been bombarded with questions from curious friends and local media since the photos were posted. "It's all everybody's been talking about and I'm just like 'we got married yesterday,'" laughed Roscoe. While they haven't got the photos back from the photographer yet, the couple, who say they like the Beatles but are "not Beatlemaniacs or anything like that" do plan to include a couple of the pictures with McCartney in their wedding album. "This is was a nice thing on a day filled with wonderful events," said Gregg. "But certainly not the best thing that happened to me yesterday." Why would you want to get married in a hat like that?